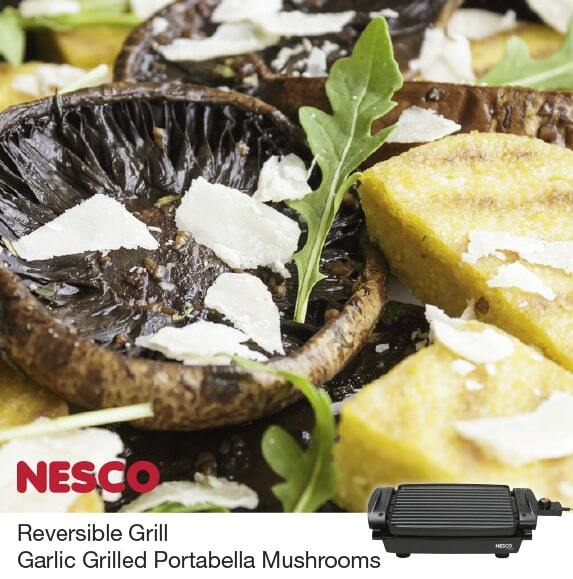 The NESCO Reversible Grill and Griddle works great for making Garlic and Herb Portabella Mushrooms. Equal amounts of shallots, garlic, basil and chives give the mushrooms an elegant savory flavor. Enjoy these tasty Portabella Mushrooms as a meaty main course or as a delicious side dish. Preheat electric griddle to medium. Place griddle near an exhaust hood, as the oil may produce smoke. Place the mushroom caps on a plate. Add the olive oil, shallots, garlic, basil and chives to a bowl and blend well. Spread the olive oil herb mixture evenly over the tops (the flat side) of the mushrooms with the small spoon. Place mushrooms, flat side up, on griddle. Cook about 5 minutes. Serve as a side dish (sprinkle with shaved cheese if desired) or as the filling in a sandwich.